Sites visited in Franklinton, Columbus, from west to east: Bottoms Up Coffee, and a new Kaufman development on Broad Street. When I first wrote to Virginia Nunes Gutierrez and Victoria Calderón Nunes of Bottoms Up Coffee, I didn’t quite know if they would consider themselves developers. In 2016, they’d bought an old post office (which most recently housed a laminating company) and put $400,000 into extensively renovating the interior into a coffee and coworking space. Bottoms Up occupies a corner of the six-lane Broad Street. Despite the charming firehouse across the street (click here to explore the street), it’s hard for an arterial road to charm pedestrians. Broad Street is no exception here: you can see over a mile straight ahead of largely unchanging scenery. 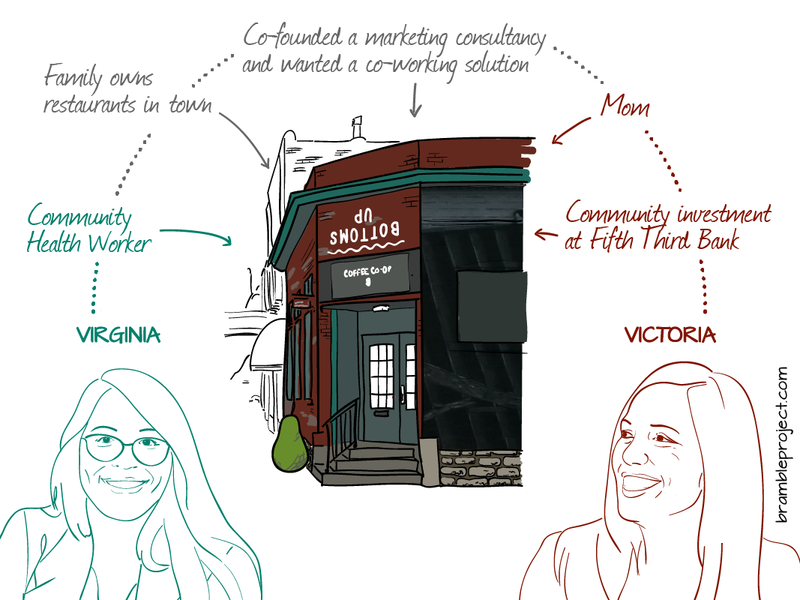 Bottoms Up was born when the sisters needed a co-working space for their social enterprise consultancy. It’s also a coffee shop that aims for affordable prices, while donating money and time toward community needs. A community health worker remains on site, so that families needing help can drop in anytime. The business responds to its location in the low-income but changing neighborhood of Franklinton, and emerges from layers of influences in the sisters’ lives. Bottoms Up is a reflection of Virginia’s and Victoria’s experiences as sisters, as business partners, and as individuals. They financed the project through Small Business Administration Loans, facade improvement funds from the City Council, personal savings, and traditional bank loans. Victoria tapped into her previous experience in community investment for connections to developers, funders, and city staffers who could advise and assist with the project. Over coffee, Victoria quickly mentioned the barriers they faced as first-generation Venezuelan immigrants and women: not knowing what resources were available; facing doubt from others that they could pull it off. And yet, being unconventional developers also had hidden strengths. They began by having a mural painted on the outside of the building, commemorating two houses that had stood on the site before a flood in 1916. This drew attention, and firemen working across the street began stopping by to help out. When they posted photos on social media of themselves chiseling away at the old wall, covered in demolition dust, someone brought in a jackhammer and helped expose the brick wall. Click here for a tour of the interior and here for more on their mission. Columbus’s Franklinton neighborhood is sometimes still said to be “struggling”. Up until at least 2015, the neighborhood continued to depopulate, leaving the very poor (Census Tracts 42 & 50; I calculated median income using Pareto interpolation of census income brackets). West Franklinton, home to Bottoms Up, is over 4 times denser than East Franklinton, home of Kaufman’s project (described next). One of the key motivators for Bottoms Up’s social justice goals was the high infant mortality rate in the Franklinton neighborhood. This reminded me of the correlation that had once surfaced between infant mortality and income inequality. The correlation seems to have lessened in recent years. One research team has suggested that economic segregation could increase infant death, but health care spending could offset it. Since high-inequality areas tend to have both economic segregation and higher health care spending, the correlation becomes complicated. These caveats aside, it’s nonetheless interesting to note that Columbus ranks among the highest in the nation in both economic segregation and infant mortality. 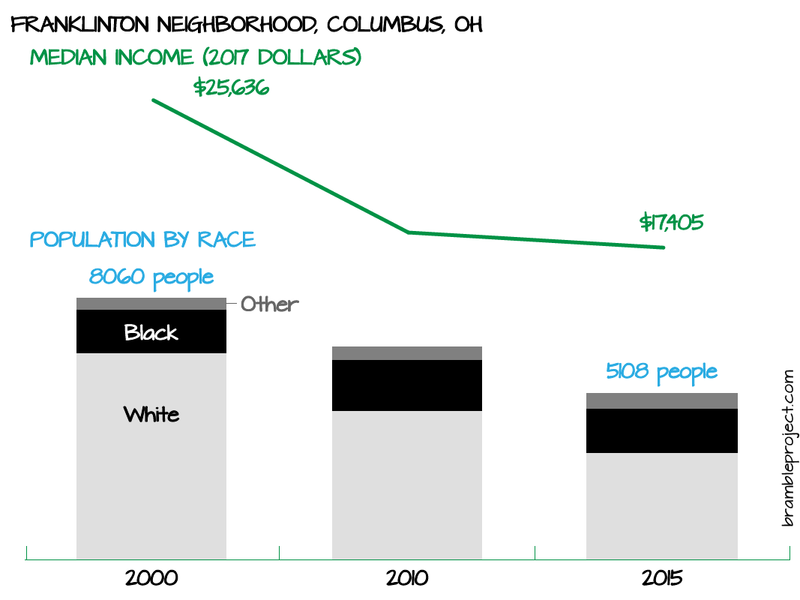 This seems significant in the context of Franklinton’s shifting demographic. The neighborhood’s infant mortality rates might improve, for example, simply if the poor are priced out. That, of course, wouldn’t solve the problem of either economic segregation or infant mortality, but it could make the statistics disappear locally. Bottoms Up will need to be mindful of this in tracking the success of their efforts. Further down Broad Street, closer to downtown Columbus, is a project underway by Kaufman Development. The architectural rendering really stands out, particularly when compared to the street as it looks now. The project is getting $1 million in City funding to set aside 15% (or 36) of the 234 total planned units for people earning up to 80% of Area Median Income. Kaufman Development’s planned project on Broad Street, Columbus. Rendering by NBBJ. Click here to see the street as it is now. Just west of the project is Franklin Station, an affordable housing community for people with special needs. West of that is an old fire station that’s being rehabilitated into nonprofit offices. What intrigues me about Kaufman’s approach is Brett’s focus on nourishing the communities that take up residence within each building. There’s something in his approach that resonates with what had initially brought me into development—a sense that modern apartment buildings can be alienating, anonymous experiences, and that thoughtful design and management can help make neighbors out of the strangers next door. For Kaufman, what began as wellness programs for residents has evolved into online portals that help neighbors connect through field trips and volunteering opportunities. Ideas brewing for the future include speaker events, dinners, and a business center turned incubator. Kaufman’s volunteer portal, run by local social welfare platform Besa, has potentially interesting impacts when considering the fact that this project will be sited in a changing, currently low-income neighborhood. There has been plenty written on the phenomenon of middle-class residents moving into low-income neighborhoods but not getting to know their new neighbors. Sociologist Tim Butler, working in London, calls this a treatment of diversity as “social wallpaper” but nothing more. If, through volunteer opportunities, Kaufman’s project nurtures in its new residents a complex understanding of, and appreciation for, those who already live here, Kaufman’s active approach to residential programming might soften this “social wallpaper” effect. As with Bottoms Up, a deep intention will be needed for success to be meaningful. The City might contribute up to nearly $4M into their project toward streetscape improvements, public parking, and affordable housing. Something that Brian and I are trying to achieve in our thinking is the right balance between hope and critique. In this marketing-habituated world, it’s easy to err broadly on the side of hoping that a development can have only positive outcomes. In this equally cynical world, it’s also easy to land too heavily on the side of critique. Both come at a cost. Many developers and neighborhoods have already tried and failed to get “gentrification without the negative”. Over-emphasizing hope can breed cynicism when unintended consequences surface. And yet, focusing on what isn’t perfect tends to put the most pressure on hopeful pragmatists who are trying to do better, while unfairly sparing those on the profiteering or ideological extremes who frankly don’t give a damn what we think. So far, in writing publicly about developers, I’ve found it surprisingly difficult to strike the right balance between marketing fluff and deflating critique, and to remain in the middle fertile ground for fruitful ideas. The two extremes feel safer, where I know I’d have company. Isn’t that interesting? If it’s tough to even write about cautious hope, how on earth do we expect to encourage developers to navigate thoughtfully in this space of pragmatic creation? Just curious, do you know what is the “area” in calculating area median income for the Kaufman project? If the area includes downtown, its likely the area median income will be considerably higher than the area median income in Franklinton. Those units reserved for people making up to 80% of area median income may only be affordable to fairly resourced individuals rather than the working poor. I’m a firm believer in mixed income communities. I think its essential to building true understanding and knocking down cultural and socioeconomic barriers. Just my two cents. If the Kaufman project does not welcome under-resourced individuals and families it will not be a truly diverse community and will inevitably become a tool of gentrification. Thanks for asking this—this is a very astute and important question. Even though gentrification is my strongest personal interest, I didn’t focus on gentrification here because Kaufman’s social focus is more inwardly oriented, and because if I wrote about private developers trying to tackle gentrification head-on, this would be quite a sparse blog. AMI is a national standard that’s set by HUD (here’s more on how they calculate it), and the geographical area is usually extremely large, incorporating entire metro areas. Franklinton’s “area” incorporates Delaware, Fairfield, Franklin, Licking, Madison, Morrow, and Pickaway Counties. In the context of your question, which is focused on local neighborhood changes, this seems ridiculous, but the large area is actually intentional from a policy standpoint. If an “affordable” studio is defined as $50/month in one census tract but $2400/month in another census tract, developers could get public money to build supposedly “affordable” $2400/month units, while housing in poorer areas would be nearly impossible to finance, due to the difficulty of meeting costs at a rental income of $50/month. This standard is mostly focused on getting affordable units within a commuting zone. As you noted, it can obscure impacts at a neighborhood level. The greater Columbus metro area had a 2014 area median family income of about $74,500/year; a 2-bedroom apartment considered “affordable to families earning less than 80% AMI” would rent at about $1,340/month. These geographical boundaries are very approximate, but within the same data set, the median family income in West Franklinton (Census Tract 50) is about $18,500/year. The median family income in East Franklinton (Census Tract 42) is estimated at $4,500/year* (with a significant $3,000 margin of error)—and no, I did not mistype that! *Note that I used 2014 data because that’s what HUD used for setting 2017 affordability targets. More recent 2015 data estimates East Franklinton’s median family income at $11,000/year, with a $10,000 margin of error. There are too few people there for statistical accuracy. Meanwhile, median family incomes in Victorian Village (Census Tract 20) and Italian Village (Census Tract 21) are $91-95,000 by 2014 estimates and $97-$117,000 by 2015 estimates (plus similar caveats on statistical accuracy). So, as you can see, the new units aren’t intended for existing Franklinton residents. People who can’t afford to live in the Short North area, though, might move in. You can dig into the data for various geographies here. Lance Freeman, a researcher who has done some deep dives into gentrification, has come up with some counterintuitive findings that continue to surprise me. For example, in his research, poorer residents were actually less likely to move from gentrifying neighborhoods than from non-gentrifying ones. His book is a very nuanced look at gentrification, including the “social wallpaper” effect that I wrote about in this blog post. Here’s a roundup of recent research on the complicated link between gentrification and displacement. As you know, I’m still only scratching the surface of how complex gentrification is here. I spent over a month writing and re-writing this post because I wanted to address gentrification in more detail, but didn’t feel I know Columbus well enough, so I’m saving my thoughts for future posts on Seattle. So why bother writing about the social conscience of projects that aren’t tackling gentrification head-on? I wrote about that a bit in my last post, but mainly, it comes down to my sense of what’s incrementally possible now. Development and gentrification is kind of like babies and climate change—the only certain way to save the planet is to stop having kids, but to keep hope alive, we tend to focus on thoughtful actions within the realm of possibility. Mainly, I’m trying to push developers to care more, but targeting perfect outcomes can become a recipe for cynicism or paralysis for me. 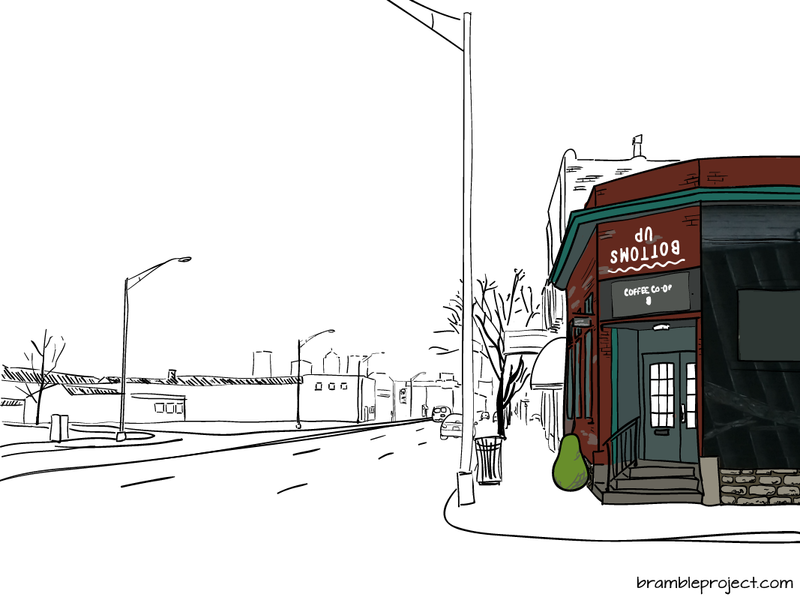 This isn’t to say that people shouldn’t worry about gentrification—they absolutely should. Even as I err on the side of what seems possible, I need idealists to keep me honest and searching. I’m looking forward to connecting with you to hear more of what you’ve seen on the ground in Franklinton. Thanks for your thoughtful reply! And I very appreciate the education on how AMI is calculated. I’m intrigued by Lance Feeman’s findings and will pick up his book. I also appreciate the balanced and thoughtful approach you take regarding the issue of gentrification. Its easy to get caught in the game of blame and shame on whatever side of the issue you fall and I enjoyed reading your article which refused to do so. Thanks. I absolutely loved this blog post and the thoughtful exchange between Bo and Jonathan in the comments section. Thanks so much for shining a spotlight on the sensitive topic of gentrification while focusing on community development and social conscience. We hope to see you again at the coffee shop someday and look forward to following your work on your blog. Thank you from the bottom of our hearts, Bo! To borrow phrasing from a friend, what I say is just a rough draft of what I think. Do you disagree with something or notice a blind spot? Please get in touch!